The tiny, silky-haired Maltese is the oldest of the toy breeds, dating back more than 28 centuries, and is one of the earliest recognized of all dog breeds. Charles Darwin theorized that they may have originated as far back as 6000 B.C. Having first been recognized on the island of Malta, the Maltese became pets for people all over the Mediterranean. Returning soldiers often brought this little breed home to Europe, thus it became popular to many royal women. In fact, Queen Elizabeth, Queen Victoria, Mary Queen of Scots, Marie Antoinette, and Josephine Bonaparte are all great women of royalty who had Maltese as pets at some point in their lives. Today’s version was perfected in the nineteenth century. Maltese are gentle and affectionate in nature. They are natural hams and love to have their owner’s attention. 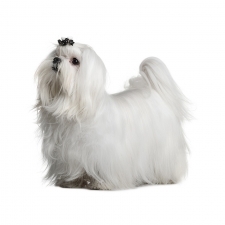 Maltese have a playful, energetic personality and make wonderful companion dogs. Devoted to their family, these little dogs love to be carried around, sleep with you, and be cuddled. However, you must teach young children how to properly play with this tiny dog to avoid any unintentional injuries. Maltese usually weigh between 4 to 6 pounds and stand between approximately 8 to 10 inches high. They have a tiny and fragile build. Maltese are known for their long, silky-like, beautiful white hair. Some people like to tie up their head hair into a cute little topknot at the top of their head. They don’t shed like most dogs due to having no undercoat. Although no dog is guaranteed to be hypoallergenic, Maltese won’t bother most allergy sufferers. Unless your dog is a show dog, most owners today opt for a “puppy” cut since it takes less time to brush and care for. Maltese are the 4th most popular dog registered with America's Pet Registry Inc. and are intelligent and easy to train. Leona Helmsley, a billionaire New York City hotel operator and real estate investor, bequeathed $12 million to her Maltese “Trouble” at the time of her death. Other famous owners of Maltese are Elizabeth Taylor, Marilyn Monroe, Tony Bennett and Barbara Streisand.